Bright orange traffic cones, the distant drone of industrial machinery, unexpected traffic delays—all signs indicate that construction season in Pennsylvania is now in full swing. Although this time of the year can be frustrating, PennDOT urges that drivers remain calm while passing through work zones to help keep their fellow Pennsylvanians safe. Following the recent approval of a bill to improve the state's roads and bridges, PennDOT has planned more construction, maintenance, and paving projects for the upcoming season than ever before. They plan to extensively pave state roads in Allegheny County and expect more than 100 road and bridge projects. With new construction projects comes new construction zones, and state officials are serious about keeping these work zones safe. Last year, the number of work zone crashes in PA increased to 1,845 from 1,666 in 2012, and in the U.S., 100 construction workers are killed annually. This year, PennDOT is warning drivers to obey lower speed limits, stay focused, and use caution while driving through work zones to protect construction personnel. State officials hope this will protect those inside vehicles as well—five out of every six work zone fatalities are drivers and their passengers. PA state troopers are cracking down on drivers who compromise the safety of work zones with strict laws and penalties. Standard fines for moving violations are doubled in these areas, and exceeding a work zone speed limit by 11 mph or more now earns motorists a 15-day license suspension. Work zones can be hazardous places for both drivers and construction workers, but following road construction safety laws can help keep everyone on the roadways safe. 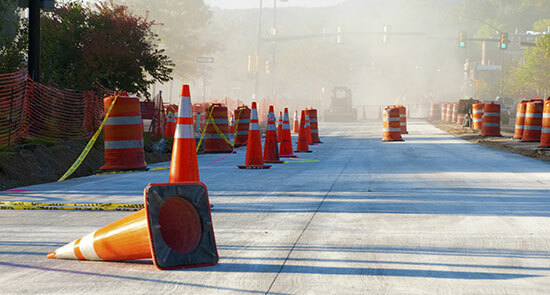 Were you injured in a car accident in a work zone? Confusing signage, debris on the road, or other bad road conditions found in poorly maintained construction zones can cause serious accidents. Whether you were injured because of a human error, poor road design, or unclear road signs—act fast because you may have a case. Call 1-866-943-3427, or fill out an online form for a free legal consultation. It's absolutely free, and there's no obligation to use our services. Don't wait – there are time limits to file a claim, and evidence disappears quickly. Phones answer 24/7. Source: “PennDOT warning to drivers: Slow down in work zones.” Post-gazette.com. April 11, 2014.